Diabetes Mellitus is a condition in which blood glucose level is persistently higher than normal values. This is due to the body’s inability to properly utilise various components of food namely fats, carbohydrates and proteins. The food that we eat is broken down into various components, a major component being glucose. Glucose is absorbed into the blood, which carries it to the body cells to be used as an energy source. 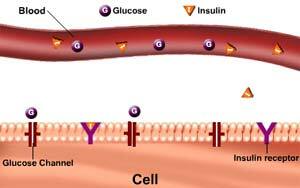 For glucose to enter the cells, we need a key called Insulin (a hormone secreted by the pancreas) to open the glucose channels. Technically, Insulin gets attached to specialised receptors on the cells called Insulin receptors to open up specific channels for the entry of glucose into the cells. In case of type 1 diabetes, the production of insulin is either very low or absent. 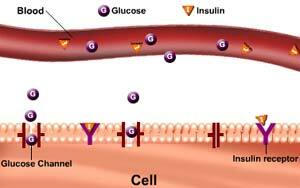 In the absence of insulin the glucose is unable to enter the cells. This results in high blood glucose levels. In case of type 2 diabetes, the insulin receptors on the cells are unable to respond properly to insulin; as a result of which the glucose channels do not open. 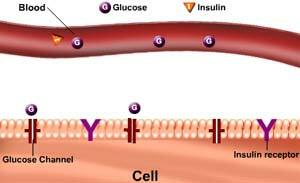 Therefore, movement of glucose from blood to the cells is restricted resulting in high levels of glucose in the blood.